This DIY kit contains all the necessary components needed to join sections of 1” conduit and build your own tent frame. All you need to purchase is the conduit and you can build your own frame. 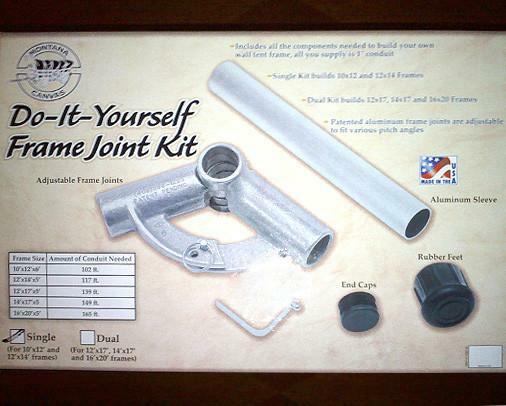 Kit includes adjustable frame joints, end caps, aluminum sleeves for making your own slip joints to join two pieces of conduit together, rubber feet for the legs and snap buttons. Single kits build up to a 14’ long frames and the dual kit will build up to a 20’ long frames. Anything larger we suggest adding extra frame joints for added strength. Specify single or dual kit when ordering.